The Big Salmon River offers plenty of variety for the avid canoeist. It is a narrow, fast-flowing wilderness river. There are long, quiet passages as well as hanging trees and tight corners. This wilderness river leads through completely uninhabited area and you will find some rocks and small rapids on this exciting river trip. Day 1: You will be picked up at the Whitehorse Airport and shuttled to the hotel. Together we do any last errands in Whitehorse before our first dinner with one another. Day 2: We drive 230 km on the Alaska Highway and South Canol Road to the put-in at Quiet Lake. While on Quiet Lake we will cover basic canoe techniques and safety for the upcoming river. Your meals will be prepared mostly on the campfire and we tent in the wilderness. Day 3: After a short stretch of river we reach Sandy Lake. Here we have excellent fishing opportunities for lake trout, grayling and pike. One can also observe for moose, beavers and eagles. Day 4: After Sandy Lake we paddle to and then across Big Salmon Lake. At the far side of Big Salmon lake we stop for a break at a picturesque trappers cabin, after which we embark on the Big Salmon River. The first few kilometers offer new challenges according to the water levels of the year, lining canoes and short portages are sometimes necessary. Day 5-11: Canoeing on Big Salmon River.These 6 days offer time to explore and fish in hidden lakes, hike surrounding hills, view wildlife (lynx, bears, wolves, and moose have been seen). We will take time two spend two nights in one special campsite and during this section of the tour we can bake bread, bannock and other savory dishes in the Dutch oven. Day 12: On this day, the river picks up pace and can move quite quickly. We will finish our day and camp at Big Salmon Village. This deserted First Nations settlement lies at the mouth of the Yukon River. 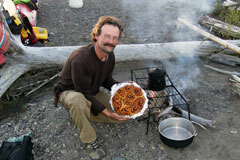 Day 13: On the Yukon River we can raft our canes together and drift leisurely to Little Salmon Village. We will be picked up by van and taken to the village of Carmacks to spend the night at a campground with shower and toilet facilities. Day 14: After breakfast, we travel 180 km by van to Whitehorse. 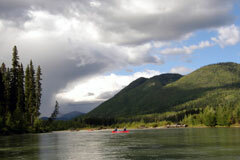 In the city we will visit the SS Klondike paddle wheeler, Miles Canyon, and the Whitehorse Rapids Fishway. We will go to the visitor center and watch a film about the Yukon. We finish our tour together over a restaurant dinner before your last night at the hotel. Day 15: Today you will have your own time to buy souvenirs. We offer a shuttle to the Whitehorse airport. We can give assurance that this trip will take place at this particular date and the itinerary can be modified to your liking. Recommendations: We recommend to acquire some basic river canoeing skills before going on this tour. An average athletic condition is suggested.